In my last post, I talked about Network IO Control. I think it’s better for me to discuss another interesting function of new vSphere 4.1, Storage IO Control. Storage IO Control is really something easy to setup and leave difficult jobs to Vmware operation. However, there are quite bit information on the Internet, I’m trying to put them together and explain it to you in an easy way. What is Storage IO Control ? Storage I/O Control (SIOC), a new feature offered in VMware vSphere 4.1, provides a fine-grained storage control mechanism by dynamically allocating portions of hosts’ I/O queues to VMs running on the vSphere hosts based on shares assigned to the VMs. 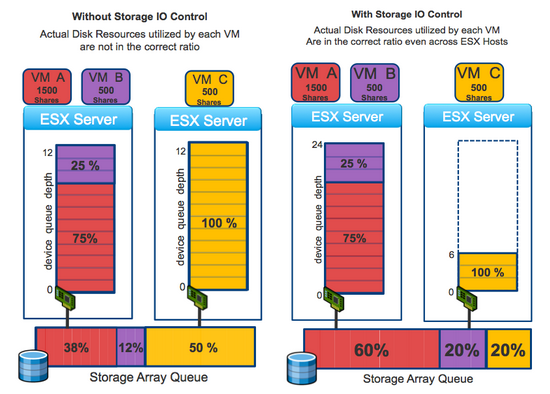 Using SIOC, vSphere administrators can mitigate the performance loss of critical workloads during peak load periods by setting higher I/O priority (by means of disk shares) to those VMs running them. Setting I/O priorities for VMs results in better performance during periods of congestion. There are some misunderstanding here. Some people say SIOC will only kick in when threshold is breached. I believe SIOC will always work for you at all the time to make sure datastore latency close to the congestion threshold if you enable this feature. Storage I/O Control has several requirements and limitations. Datastores that are Storage I/O Control-enabled must be managed by a single vCenter Server system. Storage I/O Control is supported on Fibre Channel-connected and iSCSI-connected storage. 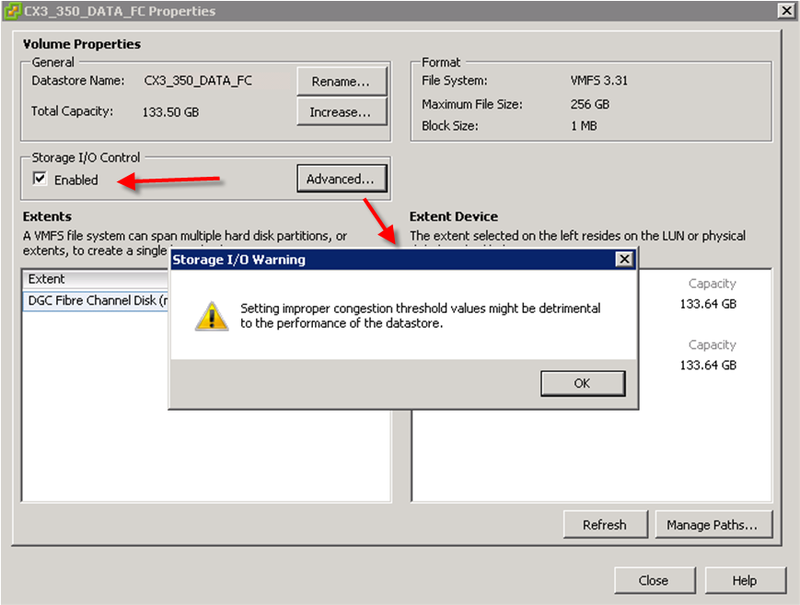 NFS datastores and Raw Device Mapping (RDM) are not supported. Before using Storage I/O Control on datastores that are backed by arrays with automated storage tiering capabilities, check the VMware Storage/SAN Compatibility Guide to verify whether your automated tiered storage array has been certified to be compatible with Storage I/O Control. (I believe the latest EMC F.A.S.T is upported with this function. But you have to wait for latest FLARE 30 to make it work). All ESX Hosts connecting to the datastore which you want to use SIOC must be ESX 4.1. (You can’t enable SIOC while you have ESX 4.0 connecting to that SIOC datastore). Of course, you need to have vCenter 4.1 as well. How does Storage IO Control work? There are quite few blogs regarding this topic. Essentially, you can setup share level for each single VM (actually, you setup for each VM disk) and apply limits if you have to. Those values will be used when SIOC is operating. Please be aware that SIOC doesn’t just monitor a single point and adjust a single value to make your latency lower than dedicate thershold. It actually change multiple layers of IO flow to make it happen ( I will explain it later). Let me quote Scott Drummonds article to explain the difference between previous disk share control and SIOC. The fundamental change provided by SIOC is volume-wide resource management. With vSphere 4 and earlier versions of VMware virtualization, storage resource management is performed at the server level. This means a virtual machine on its own ESX server gets full access to the device queue. The result is unfettered access to the storage bandwidth regardless of resource settings, as the following picture shows. As the diagrams clearly shows, the current version of shares are on a per Host basis. When a single VM on a host floods your storage all other VMs on the datastore will be effected. Those who are running on the same host could easily, by using shares, carve up the bandwidth. However if that VM which causes the load would move a different host the shares would be useless. With SIOC the fairness mechanism that was introduced goes one level up. That means that on a cluster level Disk shares will be taken into account. As far as I believe, SIOC starting point is no long only manage a single host IOPS, instead, it monitors data-store wide level, Host HBA queue and VM IOPS together to dynamically monitor and adjust IO. If the flag is up, SIOC will come down and adjust multiple layers IO to make sure high disk share VMs are prioritized. Each VM access to it’s Host’s I/O queue. SIOC must make sure it’s base on I/O priority of VM (disk shares). Each Logical device I/O queue of each host. The lower limit is 4 and Upper limit is minimum of (queue depth set by SIOC and queue depth set in the HBA driver ). SIOC monitors the usage of device queue in each host, aggregate I/O requests per second from each host (be aware this is aggregation of I/O numbers and per I/O package size and divide by seconds)and datastore-wide I/O latency every 4 seconds (for individual datastore). Also throttles the device queue in each host. How to setup Storage I/O control? Let what I have mentioned above, it’s fairly easy to setup as long as you go through prerequisite list. All what you need to do is to tick that box. If you try to customize threshold, you can click Advanced button. In terms of seeing SIOC is actually working, please go to vCenter->Datastores->select your storage->Performance. You can see none of VM disks have more than 30ms latency. (sorry, there is no work load in the picture).